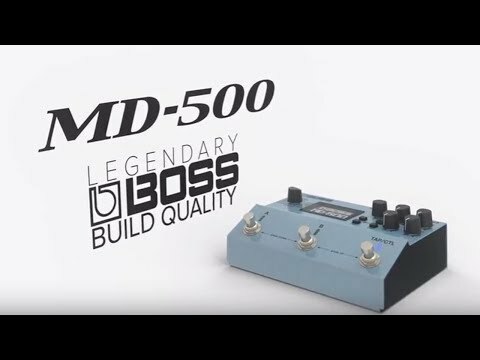 Product Overview Powered by advanced BOSS technology, the ultra-versatile MD-500 delivers nearly any type of modulation effect a musician could want, and then some. Included are 28 different algorithms with intensive programming parameters, offering a nearly limitless sound palette to create with. And with class-defying 32-bit AD/DA, 32-bit floating point processing, and 96 kHz sampling rate throughout, you’ll enjoy pristine sound quality that extends beyond the capabilities of the very best studio hardware. • Chorus—Four types: Prime, CE-1 Chorus, CE-1 Vibrato, and TRI-CHO. • Flanger—Two types: Prime G (for guitar) and Prime B (for bass). • Phaser— Three types: Prime G (for guitar), Prime B (for bass), and Script. 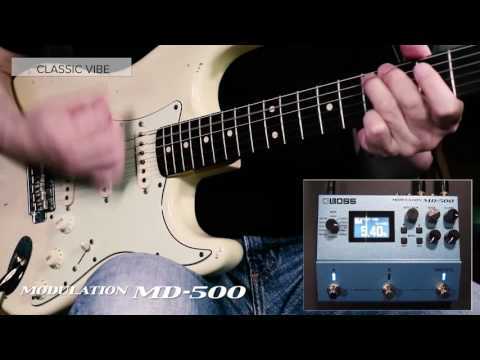 • Classic Vibe—Two types: Chorus (mixed output) and Vibrato (effect-only output). • Vibrato—Two types: Prime and Scanner (tonewheel organ-style vibrato). • Tremolo—Four types: Prime T and Prime P, plus Twin and Deluxe amp-style tremolo. • Dimension—Models the legendary Roland SDD-320 Dimension D rack unit; includes the original four sound modes and an all-new fifth mode, plus a user setting for saving any combination of modes. • Ring Mod—Classic ring modulation effects, plus Intelligent mode for enhanced clarity when playing scales. • Rotary—Vintage rotating speaker effect with slow and fast speeds. • Filter—Auto wah and touch wah (with independent types optimized for guitar and bass), plus pattern filter type. • Slicer—Original BOSS effect derived from the popular SL-20 Slicer, with programmable options not available in the SL-20 pedal.